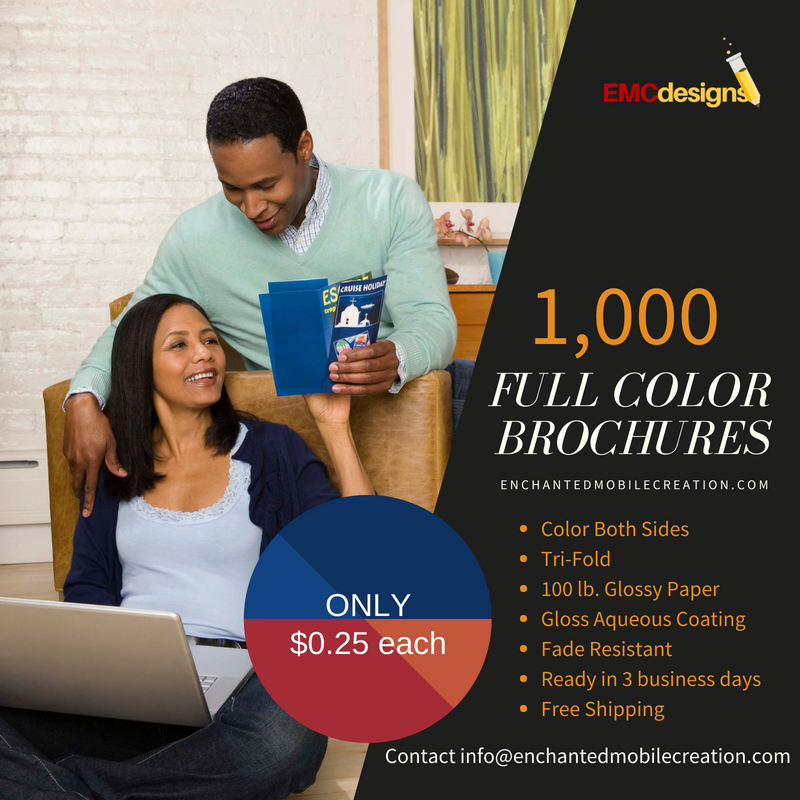 Brochure printing is one of the most impactful yet low cost marketing strategies. Used by both small startups and established companies, brochures are able to unravel a business’ value and product highlights. It’s an item customers keep to better understand your business. What does “size (before folding)” mean? “Size before folding” refers to the brochure’s length and width before it is folded into panels. We let you choose according to the total size since the folded size differs per fold. You can refer to the image above for how the size appears before folding and the corresponding folded size for each folding option. What are the most popular brochure sizes? The most popular sizes depend on the number of folds. For half-fold brochures, the most popular sizes (before folding) are: 5.5”x 8.5”, 8.5” x 11”, and 11” x 17”. The most popular sizes (before folding) for three-panel brochures are 8.5” x 11”, 8.5” x 14”, and 11” x 17”. Should I use paper or cardstock material? We recommend 70 lb. uncoated paper if you need to write information while discussing details with a client. The 80 lb. and 100 lb. glossy papers offer more durability with a shiny finish, perfect for handing out or giving away at an event. The 10 pt. cardstock is preferred for those who need something extra durable for display, as inserts or giveaways with products, or as mailable brochures. Our folding options provide two, three, or four-panel folds. We fold all paper stock and 10 pt. cardstock brochures before delivery. Find out how you can utilize the space available in each choice below. Our most popular option, this classic brochure fold has three panels on each side. Also called a letter fold. These are handy enough to give away and carry around at an event that draws crowds, such as a weekend market or trade show. A simple fold that divides your brochure in half. This folding option creates two panels on each side, providing enough space for several paragraphs and large-sized images. This fold is named after its characteristic Z-shape that divides the brochure into three panels. Here you have more space to go into details about your business value or product offers. This presentation-style fold creates two symmetrical panel doors that open to reveal a three-panel interior. It’s perfect for showcasing the features of a particular product within the interior panel, such as a new fashion or furniture collection. This folding option divides the brochure into four equal panels. First, the paper is folded in half and then folded again in a direction perpendicular to the first fold. Depending on your preferred size, both front and back sides provide enough space for a visually-oriented design on your company’s corporate information or detailed sections on your services. 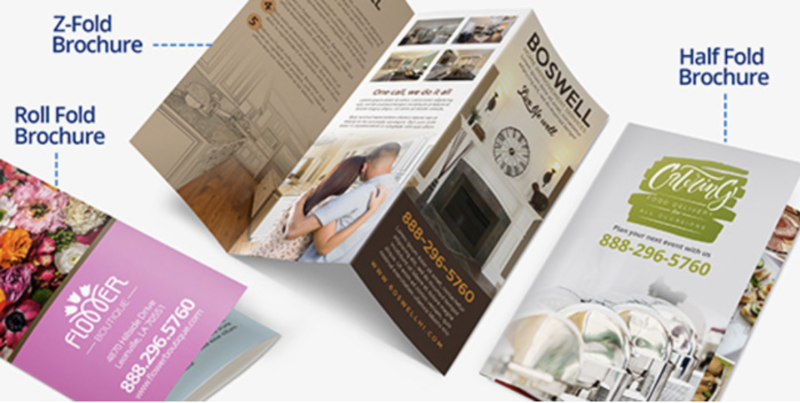 This fold divides the brochure into four equal panels using alternating folds that form an “accordion.” List down your service or product offers per panel or have the designs in each section complement each other as a whole. With this custom brochure fold, the paper is folded in half toward one side, and then folded in half again in the same direction, parallel to the first fold. It gives enough space for large images in the inside panels, perfect for promoting a big event and its schedule. This is where the folding starts at one end and rolls inward into itself. In double gate folds there are three parallel folds. The left and right edges of the paper fold and meet in the middle, along a center fold, and are then folded again toward the center. 70 lb. Uncoated Paper- This is our thinnest brochure paper and can be likened to copy paper, but with higher quality, and with slightly more weight. It makes for easy folding and is the best choice for writing on with a ballpoint pen. 80 lb. Glossy Paper- This thin paper comes with a smooth texture but shiny finish. 100 lb. Glossy Paper- Full-bodied paper perfect for folding, coated with a gloss finish for brochures and offers more durability. 100 lb. Matte Paper- Same thickness as 100 lb. glossy paper but with a subdued, matte finish for an understated and softer look and feel. Ballpoint pens with oil-based ink and permanent ink markers can write on this paper. 10 pt. Glossy Cardstock- This durable, lightweight cardstock can easily be folded. It also has a glossy finish to protect the design and make colors appear more vibrant. 10 pt. Matte Cardstock- Same thickness as 10 pt. glossy cardstock but with a subdued, matte finish. Ideal choice when you want heftier brochures. Ballpoint pens with oil-based ink and permanent ink markers can write on this paper.